When glucose is metabolized for energy, one of the early steps is the breaking of the six-carbon glucose diphosphate into two three-carbon sugars or trioses. One of the two sugars is glyceraldehyde-3-phosphate and the other is a related sugar that can be converted to glyceraldehyde-3-phosphate by the action of triose phosphate isomerase. This conversion allows all products of the initial glucose molecule to be further metabolized for maximum energy yield. 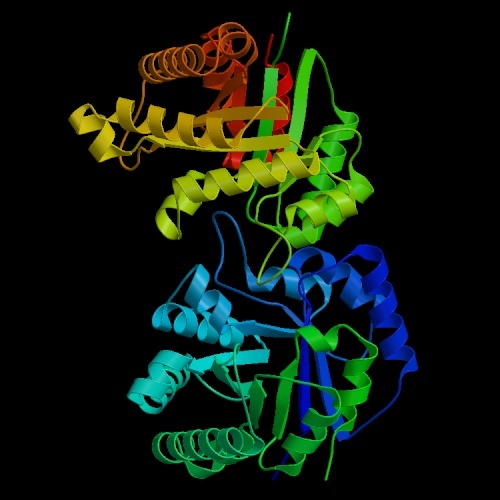 The enzyme gives its name to its folding pattern -- the TIM barrel, which consists of a cylinder conposed of beta sheets surrounded by a rosette of alpha-helices. In the marked sequence below, note the alternation of alpha helix, beta strand and turn sections. The music begins with a slow section that samples the amino acids of the protein at fairly long intervals. Then the full sequence is played through several times with different structural elements featured. The sequence pauses briefly between each reiteration of the sequence. First a simplified version of the folding pattern is demonstrated, with just the turns, represented by tubular bells, emphasized under a soft playthrough of the entire sequence. Then the sequence is repeated in a more complex form: plucked strings representing alpha helix and a low reed representing the beta strands are added to the turns. On the third repetition, the alpha and beta voices drop out and the polar and nonpolar amino acids are divided between strings and reeds to demonstrate how these amino acids are spaced through the protein. Finally all of these features are represented in the final play-through. The piece ends with periodic sampling of the amino acids in the sequence.